Aerial view of the Glasgow Queen Station. Image courtesy of Network Rail. Artist’s rendering of the proposed station entrance. Image courtesy of Network Rail. The station redevelopment will include replacing the main entrance of the station with a 500m² modern glass frontage. Image courtesy of Network Rail. The third busiest railway station in Scotland, Glasgow Queen Street, is being expanded to form a larger facility with superior services for growing passenger numbers. Announced in 2014, the station redevelopment will be part of the £742m ($1.08bn) Edinburgh Glasgow Improvement Programme (EGIP). The station redevelopment project is being managed by Network Rail, financed by Transport Scotland, and monitored by ScotRail Alliance. Network Rail selected Buchanan Partnership as the development partner for the project. The station currently handles approximately 20 million passengers a year, and this is estimated to grow to 28 million by 2030. The redevelopment is expected to be completed by June 2019. Built by Edinburgh and Glasgow Railway, Glasgow Queen Street station was opened in February 1842 and eventually became part of North British Railway. The station provides access from Glasgow to northern and eastern Scotland. The travel time from Glasgow to Edinburgh is roughly 45min. The closure of Buchanan Street station resulted in a growth in passenger numbers at Glasgow Queen Street from 1966. The first part of the public consultation for the station redevelopment began in February 2014, and was completed in May 2014. This was followed by the second part, which took place between September and December 2014. BDP prepared a plan for the Queen Street station overhaul in February 2014. Network Rail submitted a Transport and Works Scotland (TAWS) order application to Scottish Ministers in June 2015. The redevelopment will replace the current 1960s main entrance at George Square with a modern, 500m² glass frontage. Millennium Hotel’s 1970s extension above the station and Consort House will be demolished, and the canopy over the footway on Dundas Street will be removed. The station platforms will be expanded to accommodate eight-car trains, and the overhead line on the high-level platforms of the station will be electrified. The waiting areas, entrances, and catering and retail spaces will also be extended, and new lighting and public address systems will be installed. Other works include an extension of Buchanan Galleries, redevelopment of the station concourse and south and west façades, and construction of a new ticket office and staff accommodation block. "The station platforms will be expanded to accommodate eight-car trains." 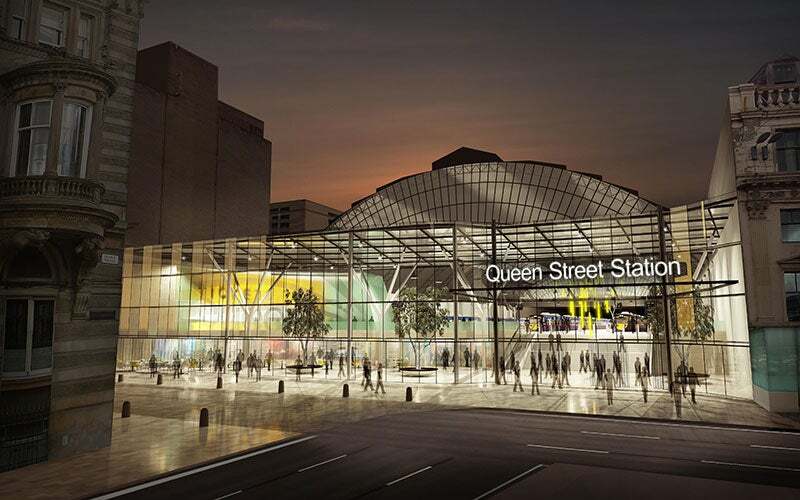 Network Rail issued tenders for the Queen Street station redevelopment in December 2015. The contract will be awarded in late 2016. Construction work to upgrade the track in Queen Street Tunnel will commence in March 2016. The existing station has nine platforms on two levels. The high-level platforms run directly north to south, while the low-level platforms run east to west. The platforms are connected by staircases at either end of the low-level platforms, and lifts can be accessed from platform 7. The passenger facilities at the station include a height-adjusted ticket counter, ATM machines, pay phones, waiting rooms, refreshments, and CCTV coverage. ARCHEAN Technologies is a French company based in Toulouse with lots of experience in the audio industry. ARCHEAN is a manufacturer of IP Public Address and Voice Alarm Systems and from the beginning it has brought innovation to the audio IP market.